I have just found another one! It’s quite different but really engaging! Hi all, after four hours no-stop researching I found an interesting interactive project around audio data visualisation and social networking. Have a look… and hear too!! aux2mondes is an internet audio work consisting of women’s commentaries that are non-narratively linked in order to create a story based upon the user’s interest and intuition. 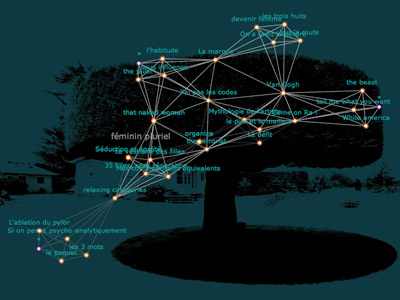 The project aux2mondes concerns representation but before all “human linkage”. Interviews and soundscape are linked with keywords and the interface traces their progress. This approach–like sound itself–resists the voyeurism inherent in representation and returns the user to her or his own self-interest. PVA MediaLab – supporting artists to develop, produce and exhibit new work since 1996! I went in London last week to follow these illuminating conferences on Digital Media. Underneath a brief introduction and useful links. Have a look! The symposium ‘Ideas Before Their Time: Connecting the Past and Present in Computer Art’ examines the ideas and technologies of computer-based art. Many intriguing concepts have emerged in computer art over the past 50 years. Some have been brought to light in the archives examined by the Computer Art and Technocultures Project at Birkbeck and the Victoria & Albert Museum. With the current exhibitions of computer art, ‘Decode’ and ‘Digital Pioneers’ ongoing at the V&A, this is a timely look at the area. Speakers from all areas of computer art, including practitioners, curators and historians, discuss the past, present and future of this area. British Computer Society in Covent Garden. with Paint on its Paws. well be brought into play. for their Ministry of Culture. détournement or ‘hijacking’ of systems, mechanisms, programs etc. He became a Zombie, after a short illness, in 1999. Luigi Russolo (April 30, 1885 – February 4, 1947) was an Italian Futurist painter and composer, and the author of the manifesto The Art of Noises (1913). He is often regarded as one of the first noise music experimental composers with his performances of “noise concerts” in 1913-14 and then again after World War I, notably in Paris in 1921. He is also one of the first theorists of electronic music.